A Metro council member has proposed a cap on the number of electric scooters allowed on Nashville roads. NASHVILLE, Tenn. (WTVF) — One Metro Council member wants to put the brakes on new scooters in Nashville. Council Member Jeremy Elrod's bill will go before Metro Council next week, not long after two new companies announced plans to bring hundreds more scooters to town. The major complaints Elrod says needs to be addressed: that riders are riding on sidewalks in popular pedestrian areas, and are parking scooters badly and in the way. Riders are allowed on sidewalks, but not in major business districts which attract heavy pedestrian traffic (think the Gulch, Lower Broadway and 12 South). These days you can't go far without seeing people traveling through Nashville by scooter. Tourist David Richardson spoke with NewsChannel 5 Traffic Anchor Rebecca Schleicher during his first-ever ride in the Gulch. "I love it, I think it's great. It offers a great alternative for traveling around Nashville if you're not wanting to Lyft or you're going somewhere that’s not too far." 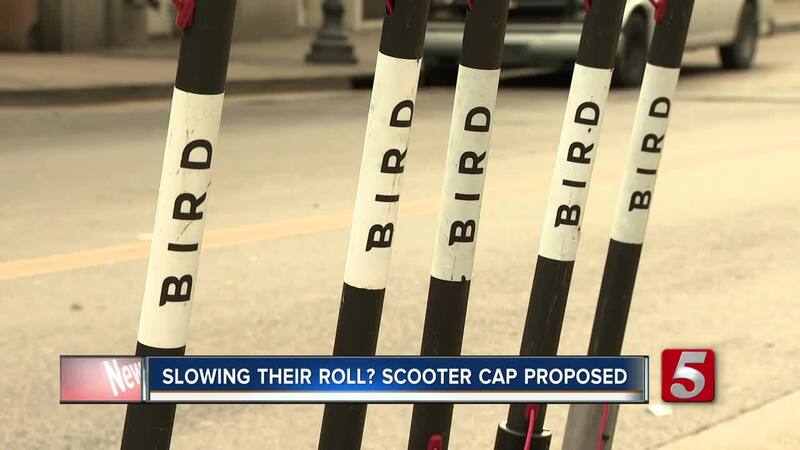 Right now, the Transportation Licensing Commission says Bird and Lime are each approved for up to 1,000 scooters on the road. Lyft confirms they have 500 in their current fleet. And last week Uber and Spin both announced plans to join in, with up to 500 scooters for Uber. Spin is approved for up to 500 scooters, but staff say they plan to start with a 100-scooter fleet and gauge demand moving forward. In total, that's more than 3,000 scooters. "I think now's a good time to pump the brakes a little bit on the number of scooter companies that are coming here," Elrod said. He is proposing what he calls a "soft cap" on only four, rather than five, companies plus a limit on scooters allowed per square mile. He says that would account for when companies set up scooters at the start of day and would allow only 340 scooters per square mile. "We need to get to that point to where people are used to them and there’s not so much backlash," he said, citing fears that if the current pilot program grows too quickly it could force the city to cancel it altogether. While regulating their numbers is sparking some debate, it does seem like scooters are in Nashville, at least for now, to stay. So NewsChannel 5 spoke with the Tennessee Dept. of Commerce and Insurance about the best ways to stay safe on the road. "If you're in an accident and you're at fault on a scooter, the scooter company will pay for the person or the vehicle that you’ve been in an accident with, but not necessarily the scooter operator," warns Assistant Director of Communication Baylie Scott, "it varies by company." She suggests considering an extra umbrella policy if you ride to cover your own medical expenses if you get injured. She also says it's important to wear a helmet and avoid sidewalks in popular pedestrian areas. Riders are reminded of those tips on each company's app before they take a scooter out on the road. Schleicher asked Richardson during his first ride if he thinks he would ride again. With him and others like him hoping on board, Council decisions on how to move forward may reshuffle the numbers. And send two companies racing to fill what could be the final open spot. "We support launching scooter fleets at a smaller scale, and ramping up based on demand. We understand a city’s desire to cap fleets initially, but believe that cities should commit to monthly reviews of caps based on usage, demand, and geographic distribution." Council member Elrod's bill was initially deferred, but will go back before the Metro Council January 15. It also gives police a way to cite children under 18 for riding, which is not allowed.